I’m down to the last few, full days of training for 2013. I’ve worked really hard the past few months, so that I could make a concerted effort to take a good deal of time off over the holidays. The majority of November’s work was delivered to Business Gateway delegates. Some courses took place in the Glasgow Chamber too, but most of the work was BG work in Ayrshire, Renfrewshire, Lanarkshire and West Dunbartonshire. Attendees tend to come from newer businesses based in Central Scotland. Their levels of knowledge span from someone with absolutely no social media experience whatsoever, to those who were doing it already, but interested to determine if what they are doing is right. The rest are often somewhere in between. It’s always a learning experience to deliver these courses, and I find that “every day is a school day” – even for me, the trainer! It’s always interesting to hear their perceptions of Social Media, and their experience with it. And then to see how those perceptions change by the end of the course. 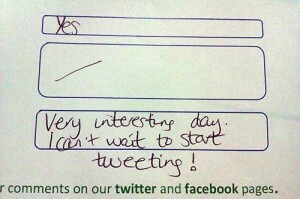 I take a keen interest in the feedback forms and am often delighted by their responses (such as the one pictured above). For those interested in LinkedIn, I delivered two one-hour workshops at New Start Scotland. As a few people asked for the slides, I decided to convert the talk into a blog 25 Tips to Rock LinkedIn over on my Glatitude Training website. Please read it and share any tips you might have of LI too! What I find staggering is that when I add up all the places I trained last month, the figure of attendees coming from these Scottish businesses comes to well-over two hundred. The number of classes that I’m now delivering is up to nine – ranging from eBusiness courses, a “get your first website/blog” course, up to five, new, Social Media courses which I’ve just started to deliver over the past two months. It’s definitely helping me to hone skills as a trainer in front of groups. Ironically, I set up my new company to deliver one-to-one social media tuition and I’ve had no time to do so as I’ve been busy doing group courses. The advantage of being an SME is flexibility so no complaints from me! WHAT’S YOUR TOP SOCIAL MEDIA PLATFORM? Speaking of flexibility, the other morning at the New Media Breakfast in 29 Glasgow, I had the wonderful opportunity to be a part of a panel along side Kyle Murdoch, Derek Howe from FatBuzz, as well as my friend Brian Canavan from Aperture Marketing. It was a spur-of-the-moment take on social media, with some tips, best practices and recommendations for 2014. I suggested people who need to find content for their blogs or social media platforms use a tool called Spundge. I sort of liken Spundge to Pinterest but for content. So instead of pinning it on a “board” like on Pinterest, you would save any content (articles, videos, pictures) to a Spundge “Notebook”. You can join me on Spundge or follow my pins on Pinterest. 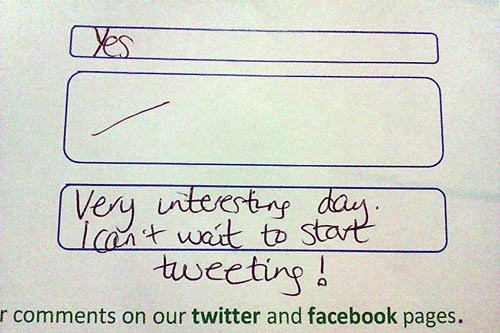 I’ll happily follow any interesting notebooks or boards you’ve got going on either platform! If you could only pick one Social Networking platform to promote your business on – what would it be? It’s tough to decide on only one. If a business were starting out right now and not on anything, my first suggestion would be Google+ especially for those businesses who are reliant on being found in Google (which is most of us). What’s your favourite or your suggested channel? Next post VEGA$ – Yeah Baby, CES 2014, Here I Come!